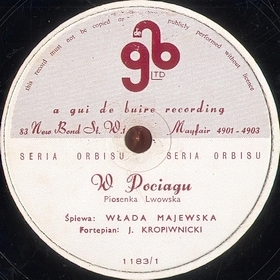 Gui de Buire (meaning "sprig of mistletoe in a vessel" in French) was a label of London recording studio Gui de Buire Recording Studios, later Gui de Buire Recodring Company, Ltd., created in 1946 and officially closed on November 15, 1957. Its owner, then sales director, was Barry Barron. Business’ address was changed several times, staying within the New Bond street, Mayfair, London. 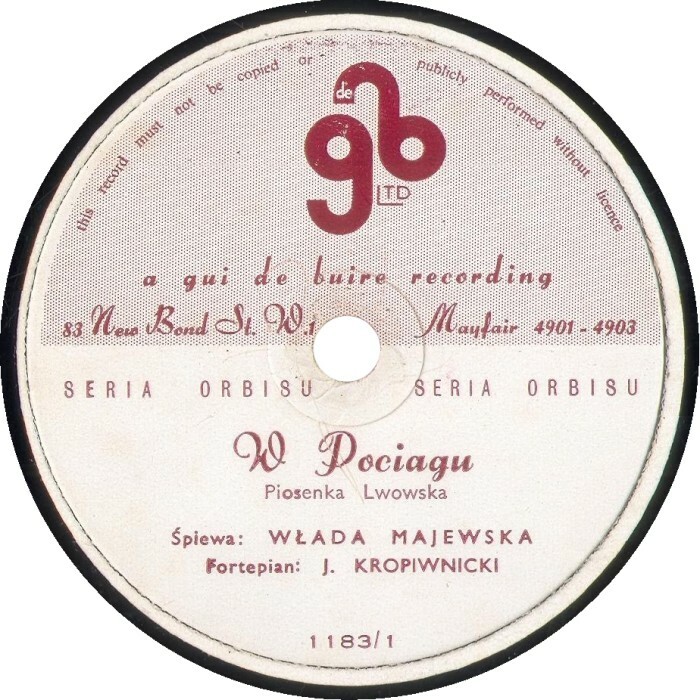 For us, Gui de Buire is interesting because it produced recordings of Polish emigre performers for the company Orbis; the latter several years later reissued these recordings (using anew made matrices) under its own brand Polonia. 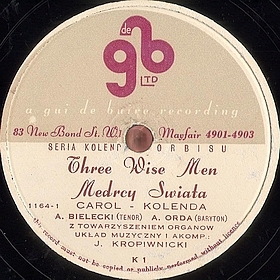 Gui de Buire’s records ordered by Orbis have inscription "seria Orbisu" (Orbis series) or "seria kolend Orbisu" (Orbis Christmas carols series). 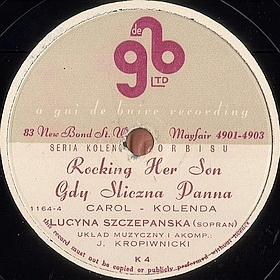 In the first case there are only matrix numbers (of the format nnnn/n, where the digits before slash are kind of recording session identifier, and after the slash -- serial number of the record within the session). 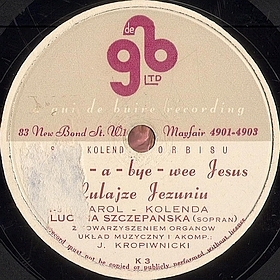 In the second case (Christmas carols series), there exist also catalog numbers of the sides, of form K1, K2, etc. 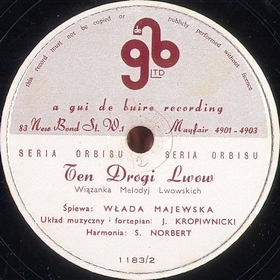 When reissued under the Polonia label, the recordings were marked using a different system of catalog/matrix numbers; there are no regular correspondences between "old" and "new" numbers. There exist also certain "transitional" test records, where the Gui de buire matrices are accompanied by white labels marked ORBIS (LONDON) LIMITED. 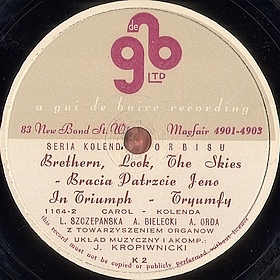 According to the identical style of inscriptions on the mirror and the fancy typefaces on the labels, all three kinds of records (the original Gui de Buire ones, the "transitional" Orbis and Polonia’s reissues) were manufactured at the same facility.